" If you like your B-movie horror served with a side of tongue-in-cheek and you know what to expect whenever you let your TV rest on the Sci-Fi Channel then you and your buddies and a large pizza might have a little fun. " A local sheriff must put his doubts aside and recognize that a string of gruesome deaths - deaths involving dismemberment and disembowelment - might actually be the work of a werewolf on the loose. Low budget werewolf shenanigans ensue. Based on a true story? That little title card preceding the opening credits is probably the funniest thing in the entire film. 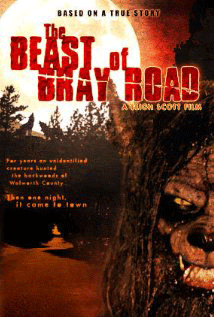 Sure, there really is a legend regarding the “beast of Bray Road” where some loonies in Wisconsin claim they’ve seen a “werewolf-like creature” roaming about, but there are no reports of said werewolf-like creature ripping people’s legs clean off. But I’m pretty sure this isn’t an issue on which I should dwell. There’s really not much to review. This is a low-budget werewolf movie on the Sy Fy Channel whose werewolf consists of a dude running around in a silly gray costume. Doesn’t that pretty much review itself? Although I must say that this movie did seem to be trying harder than your typical Sy Fy Original. The acting is surprisingly solid. Well, contextually speaking, of course. I dare say that I even liked the sheriff (Jeff Denton). The man knows how to chow down on a piece of gum, and his sarcastic, tough-guy delivery could lead to bigger dividends in his career. Do I recommend this to audiences nationwide? Not unless I want to suffer the wrath of little old women yelling at me, asking how in the world I could recommend this. You need to already possess a love for B-movie horror flicks to get any value out of it. And this had enough cheesy laughs to keep my interest. But once again, I’m afraid this film tried a little bit harder than it should have. I wanted more bad puns and cheesier one-liners. From out of nowhere, Billy Vera shows up, removes a cigar from his mouth, looks into the camera and deadpans, “Somewhere between lycanthrope and love.” The kids stare incredulously at him as he disappears into the night just as quickly as he arrived. One of the kids speaks up and exclaims, “Well don’t that just BEAT all!” After pausing a second, the entire group bursts into laughter, effectively breaking the tension. Then the werewolf shows up and rips off everybody’s arms and legs. Check the Odds & Ends section if this joke makes no sense to you – and I understand that it most likely doesn’t. That’s not my fault. I’ve upped my standards; so up yours. Later in the movie – during a climactic standoff with the werewolf – the sheriff shows up and calmly replies, “Someone call Bob Seger because his Silver Bullet Band has come to play.” He then pulls out a huge machine gun loaded with silver bullets and introduces the werewolf to his demise. Welp, that’s about all I have to add. It’s obvious that the filmmakers and actors didn’t have a lot to work with, but they gave it all they could I suppose. Is it in the top pantheon of werewolf movies? Of course not. But it manages to be better than Cursed, and that tripe had Wes Craven’s name and a $35 million budget behind it. Take that for what it’s worth. Sure, it’s not worth purchasing for $19.99 on DVD, but for free on TV with your Mystery Science Theater-loving friends? Sure, why not? Billy Vera and his band the Beaters had a huge hit in 1981 with At this Moment. My mom had the LP and drove me crazy because she’d listen to that song over and over and over. It’s been making ladies swoon for 25 years. It really took off when it was used on an episode of Family Ties. The Billy Vera and the Beaters hit that inspired my joke is Between Like and Love. For those of you not in the know, a lycanthrope is the “scientific” name for werewolf. Seger used to sport enough hair to possibly be confused with a werewolf. Jeff Denton is in King of the Lost World with Bruce Boxleitner who is in Tron with Jeff Bridges who is in True Grit with Josh Brolin who is in Hollow Man with Kevin Bacon. Other than a good amount of blood and severed limbs, the Sy Fy channel version of the film is fairly tame. This is a fantastic web page, would you be involved in doing an interview regarding how you created it? If so e-mail me!